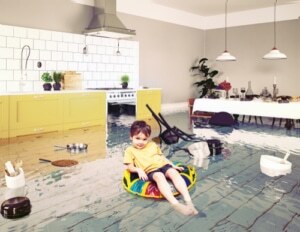 Emergency Water Damage - Water Restoration in Louisville Ky.
Do you have an Emergency Water Damage? Home water disasters are not predictable. You may wake up in the morning to a soggy mess from a slow leak, or arrive home from a weekend trip to find a burst pipe and water standing in your hallway. Whatever the cause—overflowing appliances, faulty plumbing or heavy rains—you must act quickly to stop the flow, contain the water and minimize the damage. When it’s time to set things right, call Louisville‘s emergency water damage repair team at the Carpet Chemist, (800) 515-1342. Our Louisville, KY technicians are trained to meet Institute of Inspection, Cleaning, Restoration and Certification (IICRC) standards for water damage remediation and restoration. We have the knowledge and high powered equipment to rid your home or business of excess moisture and restore your water damaged carpets. Find out what customers are saying about our cutting-edge process and five-star service! Most people know that flooding permeates homes and creates an atmosphere where mold and mildew can flourish. Did you know that slow leaks and appliance overruns pose the same danger? Unsuspecting homeowners might see only a small portion of the areas penetrated by moisture. Water left in nooks and crannies in walls can harbor mold and give off unpleasant odors. Padding under carpet might be dampened, creating a perfect environment for mold and bacteria growth. When you have an emergency water damage that wets your carpet, contact the Carpet Chemist immediately. Fast action and careful monitoring can prevent these health hazards to your family. For a fraction of the cost of carpet replacement, the Carpet Chemist returns your home to the healthy, beautiful carpeted sanctuary it was before your water disaster. Did you know that only 30% of carpet sent to landfills is worn out? Millions of square yards are needlessly discarded each year. Why spend the time and money to replace carpet that can be repaired or re-dyed? The Carpet Chemist has innovative solutions for water damaged carpet repair or faded carpeting. Our gallery shows how we make stains, tears, water damage and dull colors disappear for pennies on the dollar over carpet replacement. Call the Carpet Chemist team at (800) 515-1342 or schedule a consultation online. You’ll save money, enjoy the comfort of renewed carpeting and help Mother Earth, too.